As we blogged two years ago, the great biologist E. O. Wilson has written his first novel. This week's Economist reviews Anthill and the reviewer says, 'in Mr Wilson ants have found not only their Darwin but also their Homer'. The Economist is particularly impressed by one section of Anthill that describes the rise and fall of four ant colonies in southern Alabama. (It was excerpted in the New Yorker and blogged by us here ). One welcome change on this blog over the last year, and increasingly in the last month, has been the introduction of guest bloggers. You can read Satinder Chohan on Alain de Botton's week at Terminal 5, Kellie Gutman joining the school that's tracking the speed of spring in the US, Kellie Payne on climate change and zombie concepts and Wallace Heim on how we judge the beauty of wind turbines. Very briefly, Satinder also writes for us here about Zameen, her play about the farming crisis in the Punjab. Kellie G's books include The Summer Camp Memory Book and John Wilkes Booth Himself, one copy of which is available (used) on Amazon for a mere £322.93. Ian Garrett, who runs the excellent Center for Sustainable Practice in the Arts, based in Los Angeles, points out that the illustration for is climate change a zombie concept? is inaccurate. In his book Why We Disagree about Climate Change, the scientist Mike Hulme discusses climate change as a 'wicked' problem, by which he means that it's complex, unique and some solutions can make it worse. 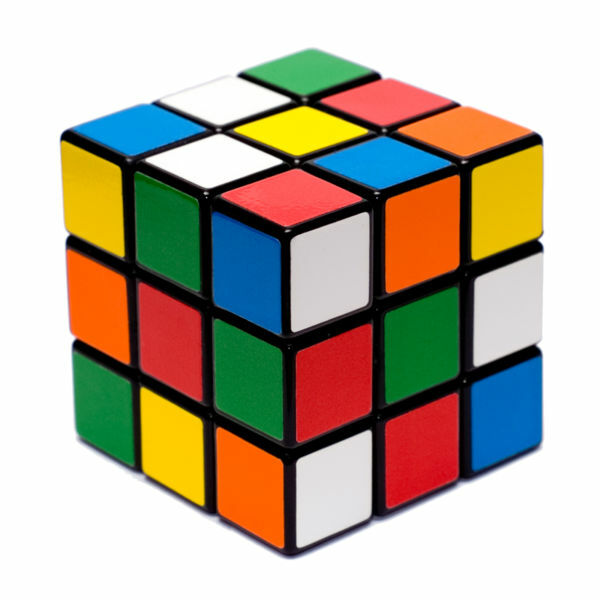 Later Hulme was on the radio comparing climate change to a rubik cube, by which he meant it would be a much easier problem to solve if the interlocking issues were unpicked and dealt with separately. can the national theatre reduce and expand? The National Theatre set itself a target: over three years, it would reduce its consumption of gas and electricity by 20%. At the same time, it would continue to expand its activities. The American author Robert Wright (The Evolution of God) likes to see dandelions on his front lawn. He'd also rather not douse his grass with 'pre-emergent' herbicides. A few months ago, I wrote a column saying that geography is the new history. I take that back. Geography is the new current affairs. are they reading the same book? 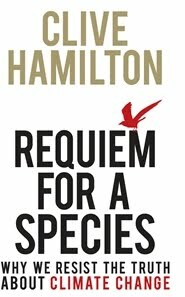 In his new book Requiem for a Species (extract here), Clive Hamilton reminds us how problematic it is for neo-conservatives to find themselves attacking the science of climate change because science is 'the very basis' of the Western civilisation that the neo-cons set out to defend. The National Theatre has just announced its summer programme, including a new play by Mike Barrett called Earthquakes in London. In his article on the American novelist and short story writer John Cheever, Edmund White makes a number of illuminating references to Chekhov. The sea breathes, the sky looks on, the steppe basks in the sun, nature whispers, speaks, weeps, and so on. A new drama series by David Simon, creator of The Wire (blogged here and here), premieres tonight on American TV. day on 10th October (10.10.10). the biggest ever day of local climate action. ... that boot room throughout the week was becoming more and more chaotic. I thought there's a huge discrepancy between the size of the boot room and the size of the earth, and the earth we want to organize when we can't even keep this boot room straight! In this guest post, Wallace Heim, co-editor of the Ashden Directory, examines our assumptions about beauty and how they shape our attitudes to wind turbines. The Guardian’s series of photographs of wind turbines, The Beauty of Wind Power, purports to show the aesthetic value of turbines in their beauty and awe-inspiring visual qualities. To back this up with use-value, the paper gives the numbers of households provided with electricity, ranging from 80,000 at Burbo Bank at the mouth of the Mersey to 145,000 in Manawatu, Tararua in New Zealand. The photographs do show striking silhouettes, the sensuous and almost animate curves of the blades and landscapes that seem to fold around the pristine and elegant machinery. The photographs are well composed, like picture post cards, and it’s this conventional representation that makes me wonder whether the wind turbines are beautiful, or whether it is more the case that it is the photographs as images that are most pleasing. It is these conventional, or unchallenged assumptions about beauty that are of interest, rather than an argument about photographic representation, because they seem to be operating on both sides of the wind farm debates. To generalise, when the opponents of wind farms extol the beauty of a landscape which will be destroyed by ugly or intrusive turbines, the counter-argument is often that those views of a landscape are historically contingent or do not take into account the industrialised character of the British landscape. That very sense of what is beautiful is reacted to as being simplistic, unchanging, too readily accepting of the bucolic as ‘right’, and needing to be preserved. Images like the Guardian’s photographs are open to a similar criticism. They are readily, too-easily, seen as pleasing if not beautiful. Their aesthetic, as well, reflects views of composition, lighting and the relation of viewer to landscape which can be critiqued as historically contingent, over-simplified, so familiar from popular media that it appears as a ‘normal’ or an unquestioned image of beauty. This may be a strategy in trying to persuade the public of the aesthetic value of turbines, but it doesn’t go far enough into questioning what is or can be seen as the beauty of these machines. Rather than settling on pleasing images or familiar vistas as justifications for or against wind farms, it can be the unsettling disjunction between the conventionally beautiful representation and the landscape as experienced that may open up debate about what is beautiful, what causes beauty and what is intolerable. The inclusion of wind turbines on land and seascapes could be changing what is considered beautiful or awe-inspiring, in ways that aren’t yet articulated, and in ways that the previous notions of beauty can’t configure. Another way to make an argument that wind power has aesthetic value is to take it into the gallery, and let that space do its work of turning industry into art. Alec Finlay’s installation sky-wheels, at the Hatton Gallery, Newcastle, was part of the AV10 Festival. On the walls are the words: ‘all art is, is rhythm’; ‘every form heals’. Sixteen small wooden turbines painted in variations of blue sit on a blue plinth. The blades don’t turn, but on each is printed words, metaphorically conveying the motion of wind: ‘turning – toward – living’; ‘turn – still – sails’; ‘what - changes – change’. 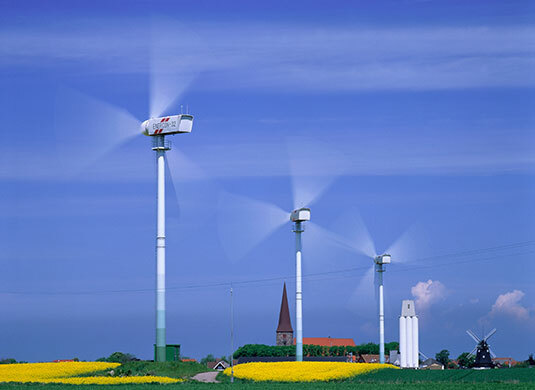 It is as if the turbines camouflaged by the blue can express a deeper poetic to their function. A series of recordings of whooshes, swishes, motor hums, and sharper, cricket-like metallic sounds is at first soothing and intriguing. But it begins to feel quickly as if the rich irregularities of waves or winds had been stripped down to a too regular noise. The manipulation into a sound work makes the sound too small, too easy to dissect. Although it was working with a different aesthetic to the photographs, it also was not doing the work of turning these structures into appreciable art. Something of the scale, the awe, the experience was missing. Even so, the installation is an appreciation of wind power, and possibly too-literal in that for some. Driving back from Newcastle, I stopped at the turbines by Junction 37 on the M6, the crossroads with the road between Sedbergh and Kendal. The five monumental structures sit on high ground between the Howgills, and the undulating slopes down to the River Kent valley and the high fells to the west. It’s a favourite picnic spot for locals during the day, and a place for lovers in the evenings. The light was fading, and the wind was low, westerly, giving the blades a gentle, breath-like cadence. The presence of those structures and their enveloping sound kept a half dozen people there, just being there, until the sun set. Photo: wind turbines on Fehmarn Island in north Germany.